Bekking Fencing Academy, formerly Ampang Fencing Centre, was founded in 2003, when fencing was still relatively unknown in the country. The founder, Gilbert Bekking, has had more than 37 years experience in the sport and has represented his home country, the Netherlands, multiple times in the past. During the course of his fencing career, he has won numerous competitions and accolades on national and international levels. Even now, he continues to compete in competitions while coaching, as competing still gives him that "tingling feeling". Bekking often shares his story of being dyslexic and having difficulty coping at a young age. After getting involved in fencing since he was 12 years old, his confidence truly developed to help him overcome his personal challenges of learning difficulties and limited motor movements (according to his Phys Ed teacher). If fencing had not been a part of his life, his story might not have ended so rosy. Because of the founder's experience, BFA's objective is not only to teach students the art of fencing, but also to use the sport to impart discipline, self-motivation and confidence. Whether youth or adult, we all stand to benefit from a sport that is not only physically demanding, but also trains us to overcome mental challenges and carry ourselves with grace under pressure. BFA has one of the most impressive facilities in the region, including eight fencing pistes fully equipped with electronic scoring apparatus. 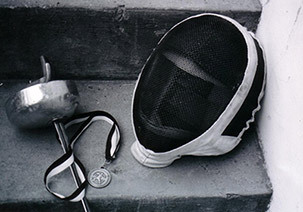 The fencing masters, including Bekking, hail from competitive international fencing backgrounds, as is required to train students for international competitions. At BFA, students are trained, groomed and molded to vanquish their adversaries and conquer arenas, in competition and in life.